(1) What plays are better presented in a large proscenium setting than in a smaller black box or thrust stage setting? (2) How is the experience of watching a play in a large proscenium setting different from watching a film on a big screen? (1) Hard to be definitive about this. Much depends on the production style chosen for the play i.e., design, acting style etc. In general, larger ‘epic’ scale works for proscenium and more intimate works for the black box. Having said that, I’ve experienced terrific ‘chamber’ Shakespeare and musical theatre. (2) This is comparing apples with oranges: two entirely different experiences i.e., the close-up and other cinematic devices like the voice-over vs the non-mediated theatre experience where distance affects reception. Thank you, Kate. Yes, it’s an abstract question, and I know it’s hard to answer! I ask these questions because, so far, I can’t think of any show I’ve seen in a proscenium setting that wouldn’t have been improved by being staged in an intimate black box setting. Conversely, some of my most treasured theatrical experiences were epic plays in tiny spaces–e.g., a full-cast Troilus and Cressida, staged in a dressing room hung with Christmas lights. It was pure magic. So when I think about the future of theater as a relevant and thriving art form in the 21st century, I tend to think that theater must become what film isn’t and can’t ever be. (I have a different answer to my second question–I can’t tell any difference between a film in a movie theater and what I see from a mezzanine seat in a proscenium. Except that I usually have a much better time watching the film because, ironically, I’m much more immersed with the characters because their expressive faces are writ large on the screen the whole time.) In other words, that the future of theater lies in small, fearless groups doing intensely personal, self-generated work. But this is a threatening concept to the multimillion dollar regional theaters, and all their high-paid designers, technicians and administrators, at whose proscenia all of us playwrights supposedly yearn to get produced! I think there’ll always be a place for the proscenium, and for Bigness in Theater in general, but I don’t think it can or should be the default. Film and television have taken over as the dominant storytelling formats. Therefore, theater must specialize. I do have a few ideas for plays that would not only fill a big proscenium space, but be BEST staged in a big proscenium space. So, stay tuned 🙂 and thanks for sharing your thoughts. I’m not sure I have a great answer for this but perhaps a useful anecdote. I saw The Pillowman on Broadway some years back. It was a huge proscenium production of course and the acting was terrific–Billy Crudup, Jeff Goldblum. But I had no affinity for the play at all. I felt completely disengaged and thought it a terribly overrated play and production. Then a few years later I saw it again in a tiny storefront in Chicago. I mean tiny. We were in a small room that held thirty audience members. My knee was touching the interrogation table in the play. And listening to the gruesome content of Katurian’s stories, I felt like I was listening to a chilling bedtime story, I felt infantilized and terrified. In other words I felt the full weight of the play, and thought it brilliant. So to me it’s finding the right space for the story and thinking about the ways in which a play asks an audience to engage. I wouldn’t want to see 1776 in a little black box because that musical is asking something entirely different of me than The Pillowman. In general watching film requires less from me. I emphasize in general, but film through editing fills in moments of imagination. It can show me an army of ten thousand, but theater demands I imagine it. I like both forms immensely but find watching theater to be more demanding–film let’s me sit back more easily and theater forces me to lean toward the stage. So interesting, Polly. Thank you. It’s funny you highlight The Pillowman–that’s my favorite contemporary play. Can you think of a real-life counter-example—a play that fell flat in a small setting, but came to life in a large proscenium setting? Or even a hypothetical counter-example? I like the conundrum of finding the “maximum” size of audience / stage for a play. I know a lot of artists who reject the idea of bigger-is-better entirely, but I think most of us, in the backs of our heads, imagine that “this [my] play would be great on Broadway.” To your point, I agree a large space is not always the most evocative option. But I wonder why I think that. I think it’s interesting to see how theatre architecture has evolved to reflect the ways we work. Perhaps, the ideal of a Broadway house is no longer part of our contemporary vocabulary. Did the urge for bigger-is-better – that drove productivity skyward in 20th Century America – somehow backfire when it comes to crafting theatre events? True, the Greeks had a way with big stages, but perhaps they understood a little more about catharsis and crowd-frenzy, and were really more akin to a great football game. Maybe our emphasis on psychological exploration is facilitated by smaller spaces. So is there an argument to be made that a 100-200 seat black-box is the maximum effective medium for the stories we tell now? And conversely we could ask, are we not telling “big” enough stories? (I say this with caution as I have written big dramas for small rooms, and I agree there is something magical that happens in a limited space.) As Polly’s knees-on-stage experience points out, this “intimacy” thrills us. Perhaps the opposite pole is not just a “formal” experience, but something more like “perspective”. What responsibility is required to expertly pilot that ship? The follow-up question murmurs just beneath the surface: as a playwright, how would I ever see a new play on a large stage? I, too, have a vested stake in telling big stories. I know that my large cast, large scale play is nearly impossible to justify from a strictly economic perspective. 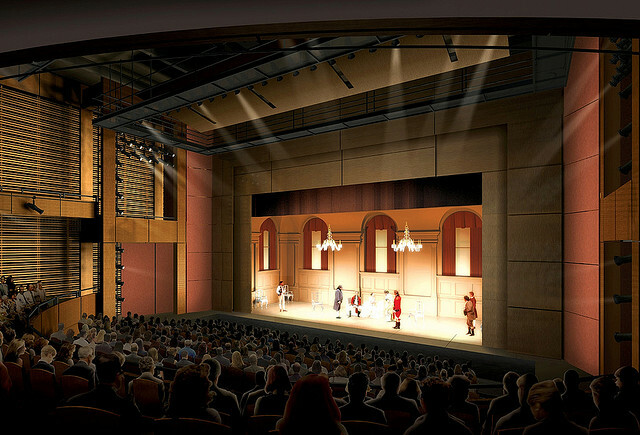 Of course we aren’t just in it for the money, but the things typically staged on the 800+ seat spaces (at great theaters like the Guthrie, for instance, or Alabama Shakespeare Festival), are major economic considerations. Perhaps we need an “impossibly large productions” channel to facilitate creation of new plays to fill up all the giant houses we have built. You in? Ha, I’d love to create an “impossibly large” new play! I’m already thinking of two, actually; one about Olympic athletes, and one about (appropriately enough) the expansion of the universe. I think both of those would be good ideas for big stages.